Challenge Finalists from throughout the world honored at MIT climate conference. 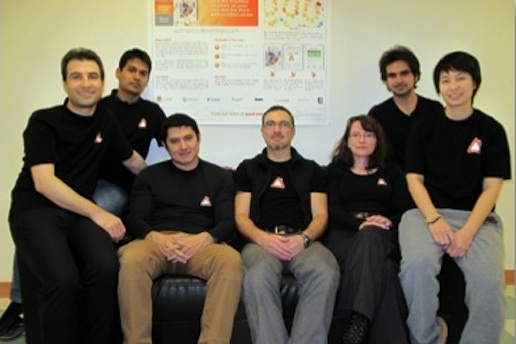 Dr. Geoffrey Hay and the HEAT team from the University of Calgary. In seeking creative new ideas to address global climate change from the bottom-up, the MIT Climate CoLab announced today the grand prize and honorable mention winners of its 2013 round of contests. The grand prize winner, Dr. Geoffrey Hay and his team from the University of Calgary, took home the $10,000 award for their proposal, HEAT (Heat Energy Assessment Technologies), a project that shows homeowners where their homes are wasting heat, how much it’s costing them, and how to fix it — all on Google Maps and all for free. The invention will help residents improve their home energy efficiency, save money, and reduce greenhouse gas emissions. Receiving an honorable mention in the contest were Peggy Liu and Chenyu Zheng from JUCCCE (Joint US-China Collaboration on Clean Energy), a Shanghai-based non-profit organization. Liu and Zheng’s “China Dream” proposal — “Reimagine prosperity; reframe sustainability; reshape consumerism” — seeks to develop a new, more sustainable vision of the good life for the growing Chinese middle class. The Grand Prize winner and Honorable Mention awardee were selected by a distinguished team of experts: Robert Armstrong, Director of the MIT Energy Initiative; D. James Baker, Director of the William J. Clinton Foundation Global Carbon Measurement Program and Former Administrator of the NOAA; Richard Schmalensee, the Howard W. Johnson Professor and Dean, Emeritus, at the MIT Sloan School of Management; and Elke Weber, Jerome A. Chazen Professor of International Business Management at Columbia University. The winners were amongst 28 winners of individual Climate CoLab contests chosen out of nearly 400 proposals that had been submitted from around the world by non-profits, entrepreneurs, experts, students, business people, and concerned citizens. They covered a broad set of sub-problems that lie at the heart of the climate change challenge, including: decarbonizing energy supply, changing social attitudes and behavior, adapting to climate change, geoengineering, transportation efficiency, and others. All the winners were recognized at the Crowds & Climate conference, being held this week at MIT. The conference explores the role new technology-enabled approaches — such as crowdsourcing, social media, and big data — play in developing creative new ideas and taking action on climate change. Focusing on the potential of bottom-up approaches could enable more sustainable business practices, influence policy makers, and reshape public attitudes and behavior. The conference is hosted by the Climate CoLab, an MIT project that seeks to crowdsource citizen-generated ideas on a range of climate change challenges. The Climate CoLab community and activity has been doubling or tripling with each annual contest, and there are now over 10,600 registered members — showing that there are many smart and creative people around the globe engaging with these issues. “We are very proud of this year’s winners,” says Professor Thomas Malone, director of the MIT Center for Collective Intelligence (CCI), and principal investigator for the Climate CoLab project. “We are looking forward to next year when we can partner with more organizations and companies to tailor contests, and when we expect participants to be able to create integrated combinations of proposals at the national and global levels.